One of the oldest beverages in the history of mankind is beer. So any of your ancestors may have had a pint or two of beer. Similar beverages are pale ale, lager, stout, and wheat beer. Yes, there are many individuals who never had any form of alcoholic beverage but for many people having a beer might be their only pure, safe to drink liquid since water wasn’t always pure. Nowadays, it ranks third in the world of consumed liquids – water is first, then tea and third is beer. Going back in history, in 1620, the Pilgrims had been at sea for nearly two months and were off-course by the time they sighted land. While they had set a course for the established Virginia colony, they had ended up in New England, and they had a problem—they were running out of beer or ale – their only safe liquid to drink. Once on land, they grew corn for food and for brewing ale, because the barley crops did not grow well. With German immigrants for centuries coming to America, beer remained popular. 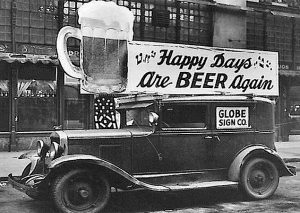 Back with Prohibition in the United States during the 1920s and into early 1930s, your grandparents may have well been affected by the illegal making and selling of alcohol, including beer. However, in March 1933 under the new president, Franklin Roosevelt, a law was signed that allowed people to brew and sell beer, in the United States, as long as it remained below 4.0% alcohol by volume. Many individuals were happy with this being allowed. 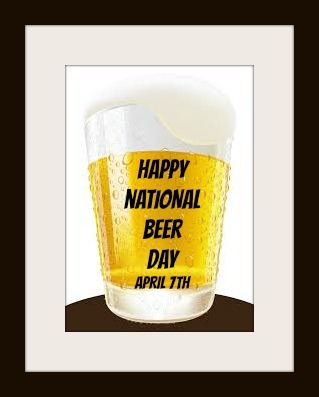 This helped create the annual National Beer Day for April 7th – now an annual celebration. Photos: Beer allowed in 1933 and National Beer Day.